My former student Ryan is living in Kazan and studying. Despite his studying, he manages to spend some time with his girlfriend, Lila. Now Ryan is an excellent guy. He is one of those men who cooks and cleans and is communicative. Lila considers herself lucky. (Frankly, Lila is worth it. If I were thirty years younger and smarter than I myself had been at that age... well, nevermind.) Anyhoo, Lila asked Ryan to go to the store to get some sweetened, condensed milk. He went. And he said to the store attendant, «Я хочу мошонку» “I want scrotum.” I leave it to you to imagine the attendant's reaction. The Russians love сгущёнка. Not only can you make various desserts with it, often Russians like to drink tea and then simply stick a spoon in the сгущёнка and have a mouthful. It is so good. Here are a few sentences. — Я люблю чай со сгущёнкой. Ты сгущёнку любишь? Хотя этот торт очень вкусный, он приготовлен без сгущёнки. Although this cake is very tasty, it was made without sweetened, condensed milk. Фу! В сгущёнке плавает муха! Yuck! There's a fly floating in the sweetened, condensed milk! А задумывались ли вы, что на самом деле, сгущёнка еще и гораздо полезней многих других сладостей – она содержит кальций и молочный белок, в ней нет красителей, дрожжей или усилителей вкуса. (source) But have you ever thought that, really, sweetened, condensed milk is still much healthier than many sweets? It contains calcium and milk protein. It has no coloring agents, yeast or flavor additives. 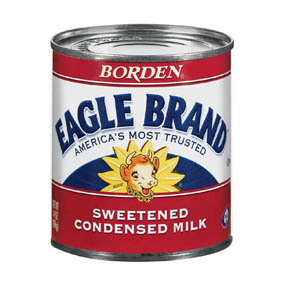 Nowadays there are generic versions of sweetened, condensed milk as well, but if I ever have a conversation with my mother, I'm sure we will not say ‘sweetened, condensed milk.’ We will say ‘Eagle Brand’ and know exactly what the other means. Another of the Russians' favorite fermented milk products is кефир kefir. You take milk, mix it with bacterial and yeast cultures, let it ferment for one or two or three days, and then bottle it. Usually it is made from cow's milk, but it's possible to use sheep or goat's milk as well. Compared to ряженка it is rather more acidic and slightly carbonated. The alcohol content in commercial kefir in Russia is usually less than 1%. It actually has live cultures in it, so it colonizes your gut with friendly flora that may have beneficial effects in human beings. 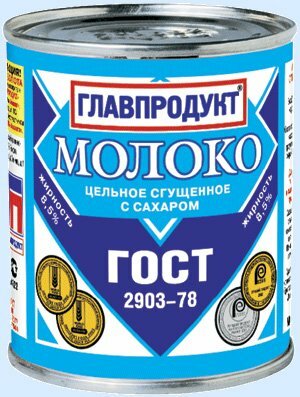 Ни в одном из магазинов белорусской столицы кефира в продаже нет. Not a single store in the Belarusian capital has kefir for sale. Скажи кефиру «Нет»! (source) Just say ‘no’ to kefir! Похудеть на кефире: всю неделю нужно пить пол-литра кефира до четырёх часов дня. (adapted from this source) Lose weight on a kefir: all week long you need to drink half a liter of kefir by four o'clock in the afternoon. Я обожаю острую пищу с кефиром — варишь макароны, на сковородке жаришь лук и красный перец, потом добавляешь черный перец, в блюдо наливаешь кефир и макароны, и со сковородки всё выкладываешь и сверху трёшь чеснок! Так остренько и вкусненько получается! (adapted from this source) I love to make spicy dishes garnished with kefir. You boil some pasta. In a frying pan saute onions plus red pepper, then add black pepper. Into a dish you pour the kefir and the pasta, and you pour out everything from the frying pan and mince some garlic. It turns out nicely spicy and yummy! Now what about the nutritional value of kefir? Here's the label. Fat — 2.5 g; protein — 2.8 g; carbohydrate — 4.0 g.
Now that's interesting. In terms of its fat content it's about the same as ряженка. 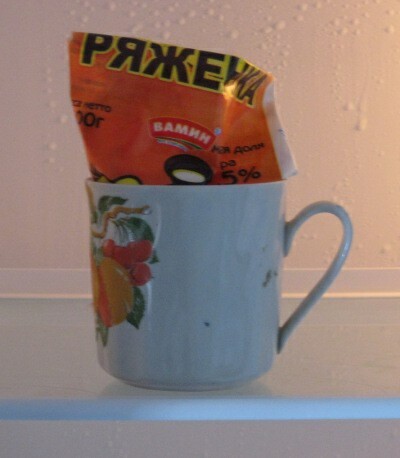 Now a thoughtful homemaker will wonder, “If it is in a floppy plastic bag, how the heck am I supposed to store an opened packet in the fridge?” Why, you stand the packet up in a mug, of course! — Где тут можно купить ряженку? Ряженка — кисломолочный напиток, получаемый из коровьего топлёного молока молочнокислым брожением. 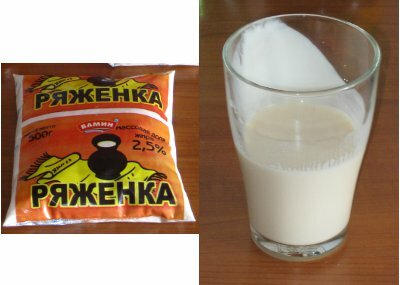 (source) Ryazhenka is a fermented milk product made from heated cow's milk by lactic (acid) fermentation. Ненавижу Америку. Там нет ряженки. А что я должна пить на завтрак? ¹ I hate America. There's no ryazhenka there. So what am I supposed to drink for breakfast? Я обожаю холодный ягодный суп с ряженкой. (recipe) I adore cold berry soup with ryazhenka. Hm. Let's see. 100 mg of ryazhenka has 4.1 g of carbs. I'm limiting myself to 20 g of carbs a day. If a glass is 250 mg, then that's roughly 10 g of carbs for a glass of ryazhenka. Damn. That's half the day's carbs right there. Guess that means that leaves only meat and fat for the rest of the day. Actually, I can live with that. ¹ This was actually said by a Russian woman visiting the US. We had no kefir, no ryazhenka, no tvorog. It was like there was no human food there at all! 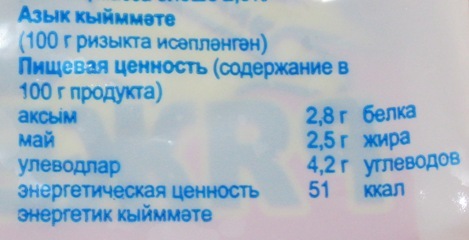 ² Note to Russian readers: in the US when listing nutritional information, the word "calorie" means "kilocalorie". So for a nutritional discussion, "calorie" is a proper translation for ккал, even though in the metric system that is properly translated kilocalorie.